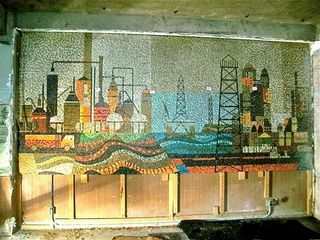 During the clearance sale, a puzzling discovery was made: a fifteen-foot mosaic mural commissioned by The Los Angeles Petroleum Club was found behind some old wood paneling. The Club had at one time maintained a posh member’s suite at the hotel. This is where the intrigue and mosaic sleuthing begins. This entry was posted in Cool and tagged mosaic, mural, urban archaeology on April 19, 2013 by Jon Lowder.